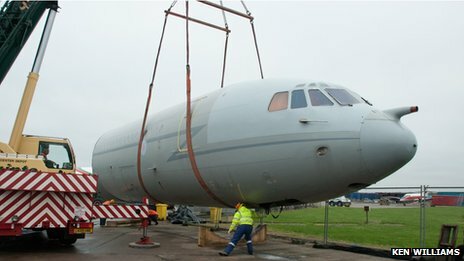 The front section of a retired RAF VC10 aircraft arrived late to an air museum by road because of fears it would not get under motorway bridges. 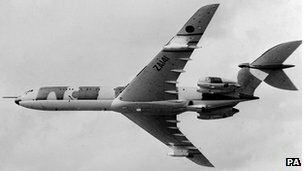 The airliner, which was part of the force's air-to-air refuelling fleet, was due to arrive at East Midlands Aeropark, near Donington, at 12:00 GMT. The park said the delay was due to making sure the plane's height on the lorry was less than 16ft (4.8m). Manager Ken Williams said the "iconic aircraft" arrived at about 15:00 GMT. The plane, which was used in Afghanistan, was due to be scrapped but will instead be loaned to the Aeropark. It had been at Bruntingthorpe, Leicestershire, since November 2012, after its last flight. About 60ft (18.2m) of the plane, including its cockpit, was loaded by crane on to an 80ft (24m) long lorry at Bruntingthorpe airfield, at Saturday lunchtime. The plane was transported to East Midlands Aeropark, via the M1 and M42, but there were concerns it could have hit bridges along the way. Mr Williams said: "We had to reduce the height considerably. "We were about three or four inches below the Leicester Forest East services bridge." Earlier, Mr Williams had said the museum, which also exhibits a Vulcan bomber, could not have accommodated the whole plane, which was about 158ft (48m) in length, with a wingspan of 146ft (45m). He said: "We have been in negotiations for six to seven months to get it here. "It's an iconic aircraft and will be a big attraction for visitors. "We hope to restore the interior to the way it would be in operational service." The VC10 arrived from RAF Brize Norton in Oxfordshire, where they were based, last November. The RAF operated 28 VC10s. Its replacement, the Voyager, is the RAF's largest aircraft, with a 60m (197ft) wingspan, and is also nearly 60m long.